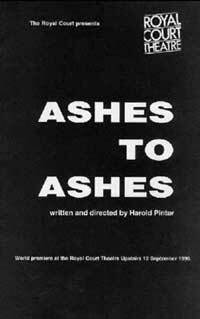 Ashes to Ashes takes us on a mysterious, sinister and hypnotic journey. More and more emerges, without our ever being able to latch on to something that would count as a journalistic fact. Unusually, as you watch it, you get the sense of the characters revealing themselves to us at exactly the same point as they revealed themselves to the author. It's as if he were making it up as he went along - and only Pinter could get away with it. Yet for all its atmosphere of uncertainty, Ashes to Ashes is utterly sure of itself - poised, deliberate, concentrated - giving off an intensely troubled air of things going on, and things held back, too painful to speak of. Like a painting or piece of music, it doesn't explain itself. 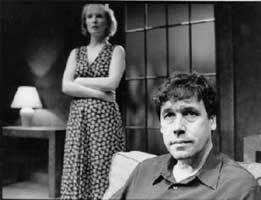 It simply exists: as masterly dialogue, superb acting and precisely focused direction (by Pinter himself). It's only an hour in length, so you have the rest of the evening to ponder what it is about. You'll need it.